The climate report released last friday is scary. How will it affect mexico? It already has...The weather patterns are definitely not the same compared to 13 years ago. It will affect the entire planet. The news talks about the effects upon the economy, but that is short-sighted. The effects will include die-off of forests, crop losses and resultant food shortages, distribution upset, and even famine. Precipitation pattern shifts will add to the problem with droughts in unexpected places, and floods in others. Hurricanes will be more frequent and more severe, as is already evident, and ice cap and glacial melting will continue to raise sea level and inundate areas where the majority of the world's populations now live. These upsets will lead to rather ugly population shifts, as well as wars and even genocide. The Earth's sixth known mass extinction period has already begun. It is not "Fake News". If we act now, in a very serious and concerted manner, we may be able to slow down the process a bit, and see some results in about 100 years. Therein lies the crux of the problem! Nobody really gives a damn about future generations, do they? Nobody does, but they will! The sun is entering one of the deepest Solar Minima of the Space Age. Sunspots have been absent for most of 2018, and the sun’s ultraviolet output has sharply dropped. New research shows that Earth’s upper atmosphere is responding. “The thermosphere always cools off during Solar Minimum. It’s one of the most important ways the solar cycle affects our planet,” explains Mlynczak, who is the associate principal investigator for SABER. We're modifying our fireplace so it will actually put out some heat. That cold shot a few weeks ago was a wake up call. Hurricanes don't appear to be statistically more frequent. However there is no real good data from earlier times since the system historically was based on ship board observation. 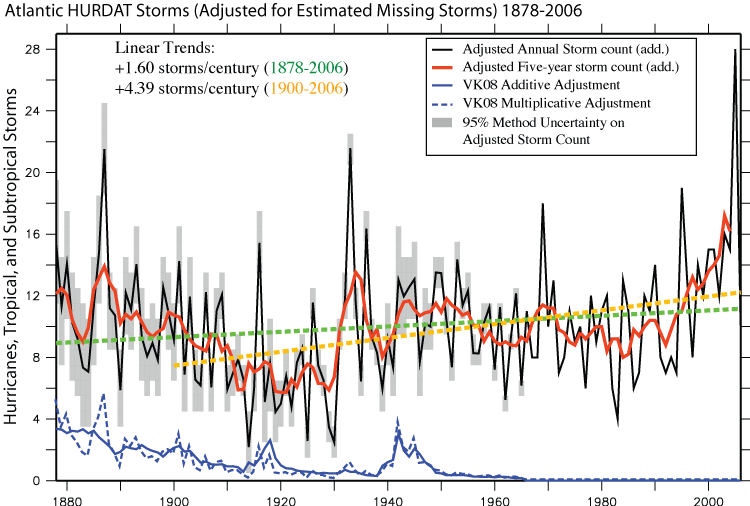 Existing records of past Atlantic tropical storm numbers (1878 to present) in fact do show a pronounced upward trend, correlated with rising SSTs (see Figs. 1 and 9 of Vecchi and Knutson 2008). However, the density of reporting ship traffic over the Atlantic wasrelatively sparse during the early decades of this record, such that if storms from the modern era (post 1965) had hypothetically occurred during those earlier decades, a substantial number would likely not have been directly observed by the ship-based “observing network of opportunity.” We find that, after adjusting for such an estimated number of missing storms, there is a small nominally positive upward trend in tropical storm occurrence from 1878-2006. But statistical tests reveal that this trend is so small, relative to the variability in the series, that it is not significantly distinguishable from zero (Figure 2). Thus the historical tropical storm count record does not provide compelling evidence for a greenhouse warming induced long-term increase. They are more damaging since so many people have chosen to live and build in historic high hurricane zones like the gulf coast. BTW how many of you know which country is the world's worst polluter? How many of you know which country has reduced carbon emissions the most? The rest is pure conjecture. What we know for sure is the planet has been a lot warmer, and CO2 a lot higher in the past. And we're still here. Too many people period is the key issue, it is driving a whole bunch of negative trends including mass migration. I'm glad I am old. Don't think I want to be around too much longer. The trend is not our friend. 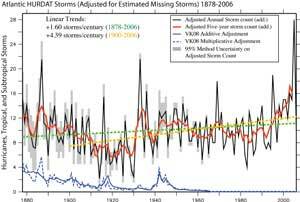 Hurricanes are neither more frequent nor more powerful than they were historically. Yes, the climate is changing and it always has and will continue to change. The earth has been both warmer and cooler than it is today. I haven't followed any scientific studies on the subject. What I do know is that every winter since we moved to Ajijic ten years ago is that we have used more firewood each year. Cold weather has started earlier and lasted longer each year. Our ancient fireplace works perfectly and doesn't smoke, so it gets used every night and is needed. It's the only heat source in this thick walled casa other than sparingly used little electric one-room heaters. Unfortunately, and why we try to avoid using ours, open fireplaces are gross polluters. Last winter was when I first noticed it seems to be getting cooler around here. We were traveling through central Mexico in mid February and encountered record cold there. Went to Mineral de Monte, evening temperature was freezing and neither hotel nor any of the restaurants had heat or fireplaces. Being somewhat spoiled by the local climate we failed to take any warm clothes with us. It was even cold at the pyramids outside of Mexico City but the hotel there did give us a heater. Won't make that mistake again. So would the best solution be efficient propane fireplace inserts (sealed, with electric fans), and/or for new construction, radiant floor heating? Are such systems used anywhere in Jalisco? Thanks. ...and you're basing that opinion on??? Maybe open eyes and ears? Plus an open mind ! There's a saying "Hire a teenager... quick while they know everything". The older generation has to protect them from themselves. And I believe the older generation of scientists who are sounding the alarm. The planet may have been hotter and it may have been colder... but there's only a very limited temperature range in which humans, crops, animals and sealife can grow and thrive.... otherwise, extinction comes into play. And I think that's already happened a number of times since the birth of the earth. Or possibly, only listening and watching a very select sample, as most do: people who agree with your own POV. I say this because I'm hearing and seeing something entirely different from members of the next generation who DO "give a flip" about the future. My point is that no one can generalize about what the "next generation" thinks. If they all agreed, I'd fear for the future of the country in general. Unfortunately the next generation are going to be the bag holders for a whole lot of bad stuff. More unfortunately they seem to be ill equipped to handle even the mildest of hard times. This may be the result of their coddled childhoods. Mexican kids seem much better equipped to adapt to hard times and set backs. Being a student of history I know that all good things and good eras do come to an end and before the next one arrives humanity tends to have some seriously not fun times. Human history really is characterized by two steps forward, one or sometimes two steps back. We talk to our grand kids about how they cannot assume things will remain relatively stable or civilized and how they need to be thinking and preparing for drastically different times. That's about all we can do at this point. Hopefully forewarned is forearmed. Always, the strongest survive and life goes on and eventually things get better. Like I said, I'm glad I won't be around when the wheels come off. I hope. As far as climate goes, if we are indeed in for some serious cold due to a new Maunder Minimum (lack of sunspots) I'd sure rather be here than, say, Canada. Something is going on as it has now been noticed and admitted that world temp average has dropped a half degree C in just two years. We may all have to move to the beach. Bring a jacket if you come to the beach! It is noticeably cooler here than this time last year. Maybe this is what is happening, again. A lot of errors in that article. (original George Santayana-1905 said, "Those who cannot remember the past are condemned to repeat it."). As far as climate history goes, it has been much hotter and CO2 has been much higher and life was quite prolific in those times. And then it got so cold that much of the northern hemisphere was covered in ice. And life went on. So I'm not clear about what we would learn from that history other than the fact that life is more adaptable than some give it credit for. However I have found there's not much to be learned from the U.S. media these days so I don't pay it much heed at all. The only takeaway I get from the above "source" is they have quite an agenda these days. I pay a lot more attention to what Russian scientists are saying and what they are saying is it is going to get colder going forward for a time. As is the recent report from the NASA scientist. What we do know for sure is there is a direct, fully established connection between sunspots and climate. And the very drastic drop in temperature over the last two years seeming to correspond with their absence once again has been documented. This report failed to take that into account at all. It is already being criticized for serious errors and emissions. Stay tuned. I'm also skeptical of any agreement that gives the world's biggest polluter until 2030 to do nothing while picking the pockets of the U.S. taxpayer to the tune of several billions was probably neither going to do much to address this hypothetical problem nor was it much of a deal for said taxpayers. Growth, and carbon emissions, is exploding in the developing world. That's the reality here and gutting the economy of one or several countries won't make a dent in that. I'm reminded of that high school science experiment where you put a few bacteria in a flask full of rich broth (food) and watch them multiply, eat up all the food and pollute the environment of the flask with their wastes until suddenly there is a basically complete die off. Rather reminds me of current trends. Meanwhile I'm going to prepare my unheated, uninsulated house for what appears to be lower temperatures on the way. THE SKY IS FALLING...Give me a break! is it global warming or global cooling??? Nobody here, nor even the so called "experts" seem to have a clue. I am old enough to remember a Time magazine article (by "experts") proclaiming the next mini ice age was imminent. Someone here mentioned that in their 10 years Lakeside he/she had seen a dramatic cooling. In the grand scheme of things, 10 years is like a pimple on a pimple on a pimple (I could go on) on the ### of an elephant. Lets all take a deep breath and enjoy the little time we have left. Someone here posted a 15,000 year temperature chart showing we are well within the normal range and have been there for some time. Where would all those so called "climate researchers" get their funds from if they projected that "all is normal and likely to stay that way". they are all mostly scam artists; in my humble opinion. It isn't global warming or cooling that is scary but climate change. That is a fact that can't be denied. Maybe temperatures are within a "normal" range but human distribution and population has changed drastically since then. Millions of people will be adversely affected. Mexico has 2 large coasts and rising sea levels threaten both of them. Recent stories about how San Diego area communities are preparing for rising sea levels. A very good answer to the OP in my opinion. Harry there really are much more immediate and well defined issues that deserve our attention, for example the decline in our local environment being driven by rampant and uncontrolled development Not to mention the severe problems with our local government that you have been and continue to work to address and improve on, and our thanks for that. The oceans rise. The oceans fall. It gets hot. It gets cold. There are too many people. Huge numbers die from wars or plagues or whatever. We here are extremely lucky to be able to live here and pretty much expect to live out our days without a lot of problems. I'm looking out my window and seeing another drop dead gorgeous day begin. I am very grateful for this. For all of its flaws it is still one fantastic place to live.